Do you think I kiss and tell? I thank you and Parks also thanks you. You two look terrific...but just a wee bit cautious! ParkerSkat, ParkerSkat - a gentleman cat never kisses and tells! We voted once. Can we vote again?? Whoa! NO, you should NOT, most definitely NOT, get to second or any other base, Mister. In fact, I think CK may be violating decency laws in like 37 states consorting with a 2-year-old! Okay, okay, good cause and all. I get it. But.....still. Good luck. Have a brilliant Sunday. MOL! PLEASE take my bro away!!! CK he is a quite the boy cat and such a nice first date. I will vote right away for this quilt. 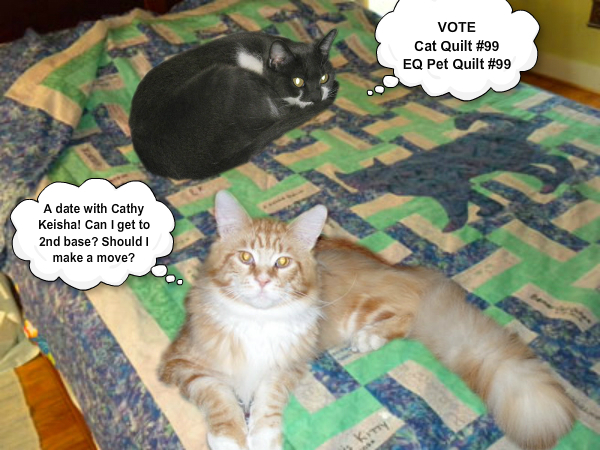 We voted for the quilt. Wow CK that young man is so handsome. But we are with Spitty. Be careful of those youngsters. We heard there was a huge party over there on that Twitter. Take care. ...CK, I know you won't kiss and tell...but I bet you just might HISS and tell! ha ha - Parker, I think you can handle CK - well maybe anyway. Go for it little brother! Oh my---you're dating more than my human is...Hmm. What's YOUR secret?? And that quilt looks cozy!! Ha ha ha ha ha! That was a good one today about the CAT, CK! You're absolutely right! How silly *is* my Human anyway??? CK! Me thoughts yous was a friend! And a younger Man Cat has turned yous!?! Oh! Me is #118!